Vol 4 | Issue 3 | Sept-Dec 2018 | page: 17-19 | Naveen Mittal, Robin Bohat, Ankush Jindal, Akash Singhal. Author: Naveen Mittal , Robin Bohat , Ankush Jindal , Akash Singhal . Department of Orthopaedics, Government Medical College Hospital Chandigarh. #3732 Sector 46C, Chandigarh, India. Introduction: Extensor mechanism disruption with other ligament injuries at knee is rare. Rupture of the patellar tendon (PT) usually occurs at the inferior pole of patella leading to proximal retraction of 3–5 cm due to contraction of quadriceps. The medial collateral ligament (MCL) is the most frequently damaged ligamentous stabilizer of the knee. MCL injuries do occur as isolated lesions or in combination with damage to other ligamentous structures (meniscus and/or cruciate ligaments). Non-operative treatment is reasonable for the second-degree and some third-degree tears, but when they occur in conjunction with meniscal tears, they are best treated by surgical repair. The incidence of meniscal tears with acute anterior cruciate ligament (ACL) injuries ranges from 50% to 70%. The risk of lateral meniscus (LM) injury is high in ACL deficient knee as a result of abnormal loading and shear stress. However, simultaneous rupture of both the PT, ACL, MCL, and LM is a relatively rare injury. Our is a case of a 60-year-old male with a history of roadside accident presenting with simultaneous PT, ACL, MCL, and LM injury. We managed the patient with acute repairing of the PT with Ethibond no.5 sutures protected with stainless steel wire and the MCL repaired with Ethibond no.5 sutures. The ACL was not repaired as the limited literature has shown high incidence of arthrofibrosis in acute repair (Shelbourne et al.). Complex tear of anterior horn of LM was seen and was shaved off. We were able to achieve full extension at 3 months. In conclusion, we want to highlight the rarity of such injuries favoring the immediate repair of PT and delayed repair of ACL for achieving optimal results. The use of our treatment algorithm may facilitate clinical decision-making in an attempt to restore stability, preserve ROM, and maximize return to activity. Keywords: Patellar tendon, Anterior cruciate ligament, Medial collateral ligament. 1. Carroll BS, Cvetanovich G, Heyworth BE, Van de Velde S, Gill TJ IVth. Approach to management of the patient with the multiligament-injured knee. Harvard Orthop J 2013;15:54-64. 2. Gulabi D, Erdem M, Bulut G, Saglam F. Neglected patellar tendon rupture with anterior cruciate ligament rupture and medial collateral ligament partial rupture. Acta Orthop Traumatol Turc 2014;48:2315. 3. Kim DH, Lee GC, Park SH. Acute simultaneous ruptures of the anterior cruciate ligament and patellar tendon. Knee Surg Relat Res 2014;26:56-60. 4. Tsarouhas A, Iosifidis M, Kotzamitelos D, Traios S. Combined rupture of the patellar tendon, anterior cruciate ligament and lateral meniscus: A case report and a review of the literature. Hippokratia 2011;15:178-80. 5. Brunkhorst J, Johnson DL. Multiligamentous knee injury concomitant with a patellar tendon rupture. Healioorthopaedics 2015;38:45-8. 6. Cox CL, Spindler KP. Multiligamentous knee injuries–surgical treatment algorithm. N Am J Sports Phys Ther 2008;3:198-203. 7. Levakos Y, Sherman MF, Shelbourne KD, Trakru S, Bonamo JR. Simultaneous rupture of the anterior cruciate ligament and the patellar tendon. Six case reports. Am J Sports Med 1996;24:498-503. 8. Costa-Paz M, Muscolo DL, Makino A, Ayerza MA. Simultaneous acute rupture of the patellar tendon and the anterior cruciate ligament. Arthroscopy 2005;21:1143. 9. Rae PJ, Davies DR. Simultaneous rupture of the ligamentum patellae, medial collateral, and anterior cruciate ligaments: A case report. Am J Sports Med 1991;19:529-30. 10. Chow FY, Wun YC, Chow YY. Simultaneous rupture of the patellar tendon and the anterior cruciate ligament:a case report and literature review. Knee Surg Sports Traumatol Arthrosc 2006;14:1017-20. 11. Futch LA, Garth WP, Folsom GJ, Ogard WK. Acute rupture of the anterior cruciate ligament and patellar tendon in a collegiate athlete. Arthroscopy 2007;23:112-e1. 12. Merritt AL, Wahl CJ. Rationale and treatment of multiple-ligament injured knees: the Seattle perspective. Oper Techn Sports Med 2011;195:1-72. How to Cite this article: Mittal N, Bohat R, Jindal A, Singhal A. A Rare and Atypical Case Report of Combined Rupture of Patellar Tendon, Anterior Cruciate Ligament, Medial Collateral ligament, and Lateral Meniscus Managed Operatively. 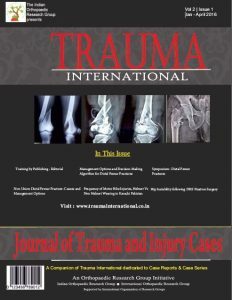 Trauma International Sep-Dec 2018;4(3):17-19.